Evan Seyfried ’16 (Economics of Public Policy) summarizes the lecture by Princeton’s Atif Mian. In 2006, house prices in the U.S. reached their all-time peak. The S&P/Case-Shiller Housing Price Index had doubled in just eight years (not accounting for inflation).1 The year before, Robert Shiller (whose work on historical housing prices led to the creation of the Case-Shiller Index) had published an update to his book Irrational Exuberance warning that recent growth in housing prices was historically unprecedented—he argued that houses were wildly overpriced and would likely revert back to a relatively constant historical value in the long run.2 His research showed that if you looked at real prices (inflation-adjusted) in the U.S. housing market prior to the early 2000s bubble, you would find that prices have not changed much since 1890! The frenzy of the early 2000s finally caught up with lenders, homeowners, and investors, who began to doubt the continued rise of house prices. In late 2005, with interest rates rising, a growing number of homeowners with Adjustable-Rate Mortgages (ARM) began to default on their mortgages. Finally, by the end of 2006 the housing bubble began to collapse under its own weight, and the shockwaves ripped through the financial sector—which had bet heavily on the U.S. housing market through mortgage-backed securities and newer exotic financial instruments. French bank BNP Paribas, on August 7, 2007, famously suspended withdrawals from its investment funds associated with subprime mortgages, a move that triggered a shadow banking run, and is often considered the official start of the financial crisis—when the housing market instability truly began to upend the financial sector. What followed was the most severe financial crisis since the Great Depression and a long recession for the rest of the U.S. economy. But there is still much to be learned about the interaction of the housing bust (leaving many homeowners with very high debt compared to their assets), the crisis in the financial sector (wherein banks have been generally unwilling to either extend new credit or restructure existing loans), and the continuing economic malaise in the U.S. and other economies around the world. What is household debt overhang? Imagine a family owes $200,000 on their mortgage. If the market crashes and the house value suddenly declines to $180,000, then the family now owes $20,000 more than the value of their house. Thus, even if the family chooses to sell the house, they will not be able to pay back the mortgage in full. This is also called being “underwater” on a mortgage. In the context of all household finances, debt overhang is a similar concept to being underwater, and refers to the amount of indebtedness of a family beyond the value of their assets, taking into account their anticipated income. Debt overhang makes a household unattractive to lenders (both for new loans and for refinancing old loans), because they do not have any collateral that is not already used to cover existing debt. Note that household debt is treated separately from other private sector debt (mainly non-financial firm debt), and shows notably different dynamics. All of Atif Mian’s research mentioned here focuses specifically on household debt. In 2013, Mian published evidence that poorer families who were highly leveraged in the housing market reacted very sharply to the loss of wealth when their homes depreciated following the housing bust. Because their marginal propensity to consume out of housing wealth (how much families spend knowing that they have a certain amount of wealth in their house to fall back on) is higher than for middle- or upper-income families, their consumption dropped disproportionately in the years after the bubble.4 Of course, at the individual level this behavior is rational, but at the national level low consumption growth in a demand-constrained economy has created a negative feedback loop of lower job growth, lower income growth, and a further drop in consumption growth. But Mian also wanted to take these insights from the Great Recession and ask more fundamental questions about private debt and predictions of economic growth: Was consumption affected similarly affected during other periods of high household debt? Do we see similar household debt effects in other countries? If so, how does this extra drag on consumption affect how economists forecast economic growth? Initially they found that high growth in household credit was predictive of subsequent low GDP growth. But they needed to identify the nature of those credit shocks to find possible causal channels. According to Mian they wanted to “rule out demand-driven shocks.” Demand-driven shocks come from the consumer side and could be an increase in the use of credit to smooth lifetime consumption, or as an “insurance effect” to get liquidity today due to uncertainty or an expectation of economic shocks tomorrow. On the other hand, a supply-driven credit shock would be banks extending more and more credit due to government policy changes or financial innovation. The first demand-driven possibility is relatively simple to disprove. Because the Permanent Income Hypothesis suggests that households borrow today in the expectation of higher future income, the fact that household debt increases should be indicative of economic growth. As mentioned before, Mian, Sufi, and Verner find the exact opposite relationship. The second demand-driven possibility is unlikely because much of the growth in household debt across all the countries in the survey is in mortgage debt, which is generally not taken on to provide liquidity. Two problems remained. First, the authors had to come up with a measure of “credit supply shocks” that could apply to dozens of different countries. Second, they had to choose a measure that could help identify the causal relationship, not just the correlation. Their solution was to use one measure for the U.S. (share of debt issuance by risky firms) and a simpler one for non-U.S. economies (the spread of sovereign debt yields compared to equivalent U.S. Treasury notes). According to Mian, these are “not instruments in the usual sense of the word” (which must satisfy the requirements of independence from the outcome variable and relevance to the explanatory variable). Rather, they are “imperfect instruments” (see Nevo and Rosen, 2012.7 for more information) and, per Mian, “as long as we can sign the covariance of the instrument, we can partially identify the range in which the coefficient lies.” In other words, because these proxies for credit supply shocks typically signify expectations of good times, then if we see that they actually predict bad times, we can at least identify a range of values for how strong the link is between an increase in household debt and subsequent low growth. The methodology is admittedly complex, and audience members had some reservations about how the authors had dealt with household debt (particularly since household debt is mostly mortgage debt). One audience member suggested that housing bubbles could be the main driver of subsequent low growth, with the extension of credit simply a side effect. Mian acknowledged that he cannot outright reject this concern, but added that the results are robust to controls for house prices, so the bubbles should be controlled for. Another audience member suggested that this could be tested for if the data set included any countries which had seen a credit boom with no attendant housing bubble. There are, in fact, some countries in the data set, but, as Mian stressed, there was not enough of a subsample for a strong statistical test of this hypothesis. After presenting the “within country” results—showing that household credit supply shocks tended to lead to lower growth in the five or so years following—Mian pivoted to the global portion of the paper. The goal here was to establish the spillover effects of these credit supply shocks among different countries. Sure enough, Mian stated that “the global cycle is more destructive” due to financial spillovers between countries. Because the growth slowdown in a given country after the credit shock leads to a reduction in imports, the problem is transferred to that country’s trading partners. Furthermore, the effects are exacerbated by “macro frictions,” especially in countries that employ fixed exchange rate regimes, borrow primarily in foreign currency, and are near the zero interest rate lower bound (although recently the zero interest rate bound has been proving not to be much of a hard bound after all). Figure 2 shows these global aggregate effects. Mian stressed that these dynamics between debt and growth, especially the global ones, should be seen as relatively recent (“last-forty-years effects”) side effects of globalization and the financialization of household debt. He concluded that governments must respond to these powerful forces with targeted macroprudential policies, and forecasters at organizations like the IMF and OECD must learn to better account for household debt in their growth projections. S&P Dow Jones Indices LLC. S&P/Case-Shiller U.S. National Home Price Index [CSUSHPINSA]. FRED, Federal Reserve Bank of St. Louis. Shiller, Robert J. 2005. Irrational exuberance. Princeton, N.J.: Princeton University Press. Thomspon, D. 2014. “How Did Canada’s Middle Class Get So Rich?” The Atlantic. April 22, 2014. Mian, Atif R. and Rao, Kamalesh and Sufi, Amir. 2013. “Household Balance Sheets, Consumption, and the Economic Slump.” Chicago Booth Research Papers. No. 13-42; Fama-Miller Working Paper. Dynan, K. 2012. “Is Household Debt Overhang Holding Back Consumption?” Brookings Papers on Economic Activity. Spring 2012. Mian, A., Sufi, A., and Verner, E. 2015. “Household Debt and Business Cycles Worldwide.” NBER Working Papers. Working Paper No. 21581. Nevo, A., and Rosen, A. 2012. “Inference with imperfect instrumental variables.” Review of Economics and Statistics. Lecture summary by Evan Seyfried ’16 (Master’s in Economics of Public Policy). Above, the author talks with Robert Lucas after the lecture. 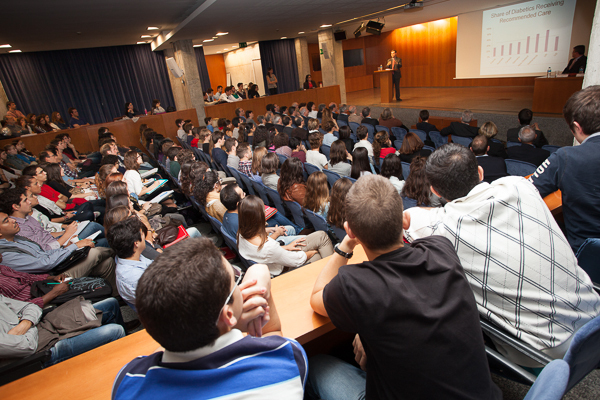 The modish Banco Sabadell Lecture Hall, overlooking grand, prosperous Avinguda Diagonal, is filled to capacity this Thursday evening. Nobel laureate economist Robert Lucas is here to present the 34th Barcelona GSE Lecture, and the GSE community is eagerly anticipating the talk. The topic would have seemed almost trite in less-skilled hands. Lucas, however, over the past decade has focused his talents on exploring economic models that might explain rapid industrialization like that of the United Kingdom starting in the late 18th century. He views the rise of urbanization and industrialization through the lens of economist Gary Becker’s theory of population fertility and couples it with a human capital growth model. This talk draws heavily from Lucas’s recent research on human capital and economic growth1, the diffusion of the Industrial Revolution2, and a rejection of the “great men” hypothesis of economic progress3. From this basis, Professor Lucas presents his most recent work on the topic. He begins with a graph—how else would an economist begin any lecture?—showing the striking relationship between a country’s prosperity (measured in GDP per capita) and the share of its population employed in agriculture. Why is the relationship between these two variables so consistent? Later in the lecture, Lucas will develop his model based on a “dual economy” of low-skilled agricultural workers and various levels of skilled urban dwellers. Its publication led to a massive controversy that rapidly spread across the landscape of political economy. Although Malthus’s work was not nearly as apocalyptic as his deriders asserted, it still pointed out uncomfortable truths about the seemingly unrelenting misery of the lower classes, even in “advancing” nations. A century and a half later, economist Gary Becker took up the Malthusian mantle with his seminal work, “An Economic Analysis of Fertility,” a study of the dynamics of family planning and income. Becker explicitly acknowledged his debt to Malthus: “[…] Malthus’ famous discussion was built upon a strongly economic framework; mine can be viewed as a generalization and development of his.”5 Becker’s further research concluded that viewing fertility as a result of marginal-cost/marginal-benefit decisions is a satisfying way to explain the phenomenon of high-income families voluntarily lowering their fertility rates. His framework implies that families with more human capital invest more resources in fewer children. The Path Off the Farm: What Is an Industrial Revolution? Lucas now presents his synthesis: Becker’s fertility model combined with Lucas’s own human capital model, both placed in the context of the urban-agricultural dual economy. Like Becker, Lucas’s model has parents view their children as “durable goods” that yield a “psychic utility” but also impose costs. As families move up the socioeconomic ladder, they make different decisions regarding investment in the “quality” of the children (everything from time spent teaching, to money invested in tutors and private schools). Over time, the quantity/quality balance leads to lowering fertility among higher socioeconomic classes. In the dual-economy framework, rural (landless or small proprietor) farmers are pushed by wage considerations to move into dynamic urban environments as low-skilled workers. At first, with no wealth to invest in their children, they make “quantity” a priority over “quality.” Over generations, however, there is a tipping point where a given family has accumulated enough resources to make meaningful human-capital investments in their children. Once this occurs, they can now move up to the higher-skilled tiers of society. Crucially, it is this accumulation, not of wealth, but of human capital, that drives further growth in Lucas’s model. The speed at which these changes occur depends on the magnitude of “interactions” in society: how often and to what degree people engage with one another in productive exchanges—anything from academic discussions to business deals. A key mechanism in the model is that economic growth itself is what allows the low-skilled workers, coming from the farms, to dependably get better and better jobs over time. Thus, the dynamic is self-reinforcing as more rural workers move to the cities. When considering the Industrial Revolution, we can appreciate how natural it would be to dismiss the intangible, fuzzy concept of “human capital” and only focus on material capital: factories, infrastructure, mines, etc. But if we view the Industrial Revolution with Lucas’s model in mind, we can at the very least see that Lucas’s statement from his 2015 paper—”human capital accumulation can account for all observed growth”1—is quite plausible. Later in the same paper, Lucas asserts: “The contribution of human capital accumulation to economic growth deserves a production function of its own.” 1 In the model Lucas has presented tonight, he answers his own demand. There is, indeed, a “production function” for human capital, and when it is coupled to a fertility model, it can show the dynamics of rapid urbanization and economic growth. In other words, it can model an industrial revolution. What does this all mean? What are the implications of this model in 2016? We go back to the graph showing the relation between GDP per capita and share of population in agricultural work. Lucas mentions how many areas of the world are still in the upper left portion of the graph—poor, agricultural, unskilled-labor-intensive economies. According to Lucas, we must not be deluded into thinking that a pastoral lifestyle is something to be preserved at the cost of indefinite poverty. Lucas states, “The idea that you can prettify this lifestyle is just plain wrong.” Rather, we have a collective interest in the flourishing of all people around the world, and we have emerging evidence that investment in human capital, coupled with smart urbanization, is one of the best ways to achieve it. With that, the lecture concludes, and the lucky attendees weigh the expected utility of waiting in line to speak with the most influential living economist against the expected utility of beating the rush to the cava and jamón ibérico at the reception. The gears of the market keep turning. Lucas, Robert E. 2015. “Human Capital and Growth.” American Economic Review, 105(5): 85-88. Lucas, Robert E. 2009. “Trade and the Diffusion of the Industrial Revolution.” American Economic Journal: Macroeconomics, 1(1): 1-25. Lucas, Robert E. 2009. “Ideas and Growth.” Economica, Vol. 76, Issue 301: 1-19. Malthus, Thomas Robert. 1798. “An Essay on the Principle of Population.” Library of Economics and Liberty. Becker, Gary S. 1960. “An Economic Analysis of Fertility.” Demographic and Economic Change in Developed Countries. Princeton: Princeton University Press.